The hotel had everything we wanted: large rooms with big comfy beds, FREE WI-FI (the fast kind, too), a great spot to grab drinks (did you see the patio? ), and delicious food. Even the bar snacks were stellar – I hope you didn’t miss the multiple videos of those on my Snapchat! Just to give you an idea, they featured barbecued turkey almonds (!!! ), wasabi crackers, herb-seasoned mixed nuts, etc. We also had dinner in the in-house restaurant, The Casual (if you can even call it that), which featured everything from tiger prawn dim sum, to risotto, to classic Schnitzel. You can check out the menu here! In addition to the amenities, the location of the hotel really can’t be beat. It can be found directly behind the Tiergarten and the Berlin Zoo! 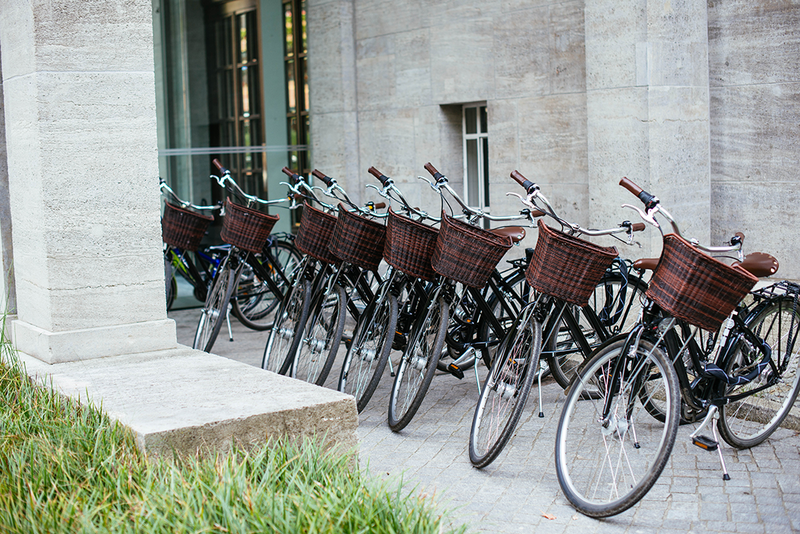 One of our favorite activities in Berlin was grabbing one of the basket-adorned bikes outside of the hotel and taking an hour-long ride throughout the length of the park. It was lovely! One more thing I should mention is the spa. While I didn’t have a chance to get a treatment while at the hotel (there was no time! ), I did take a minute to walk through – it. is. STUNNING. 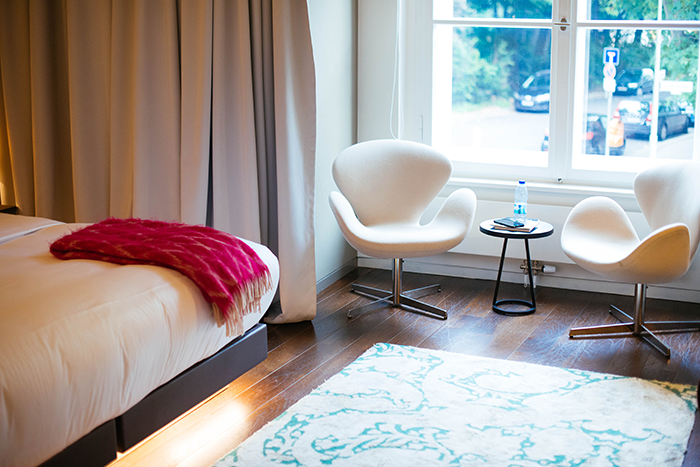 If you stay at Das Stue, definitely make an appointment at the spa during your stay! I regret not doing it! 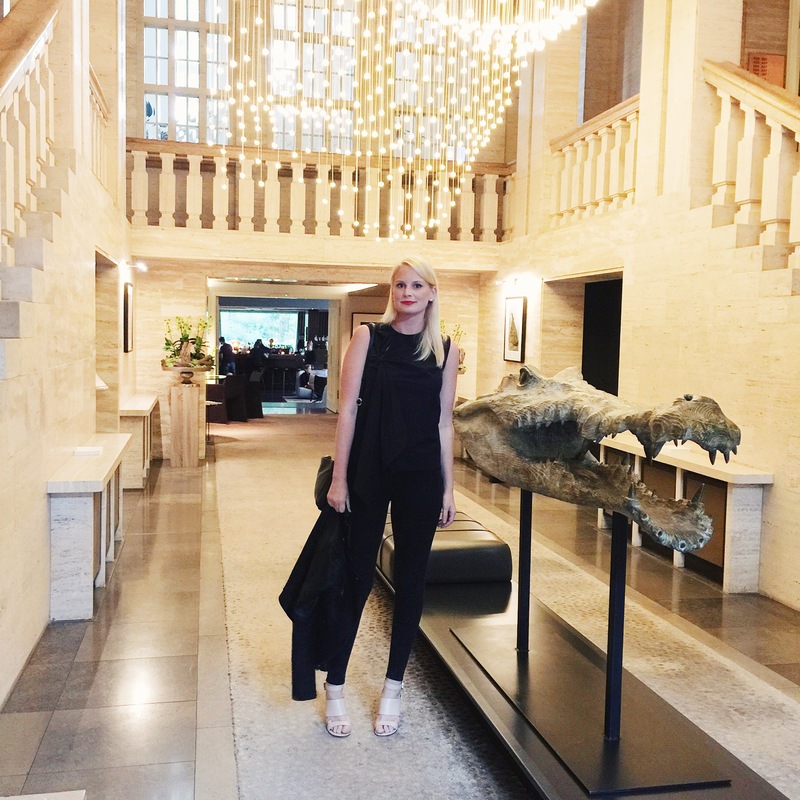 Scroll down to see all of my photos from our stay! 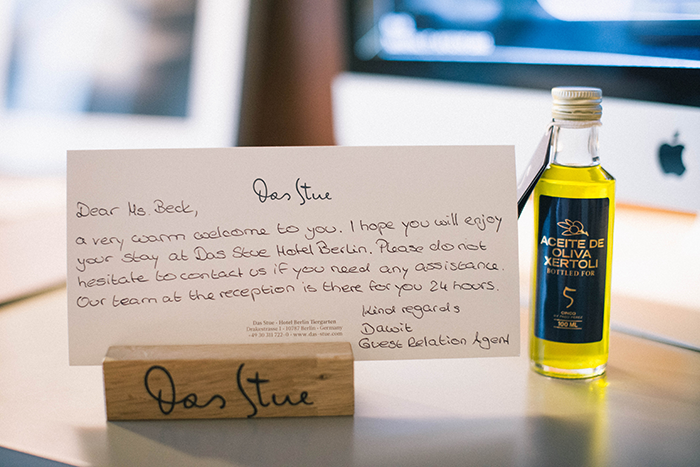 Click here to learn more about Das Stue and to book your next trip to Berlin! 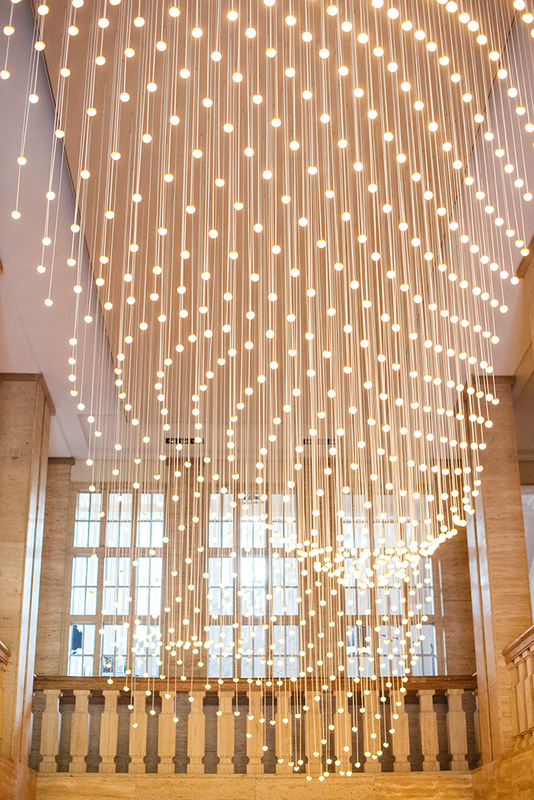 Nothing but glowing recommendations for this place!! Our favorite restaurant in Berlin had to be Pantry! 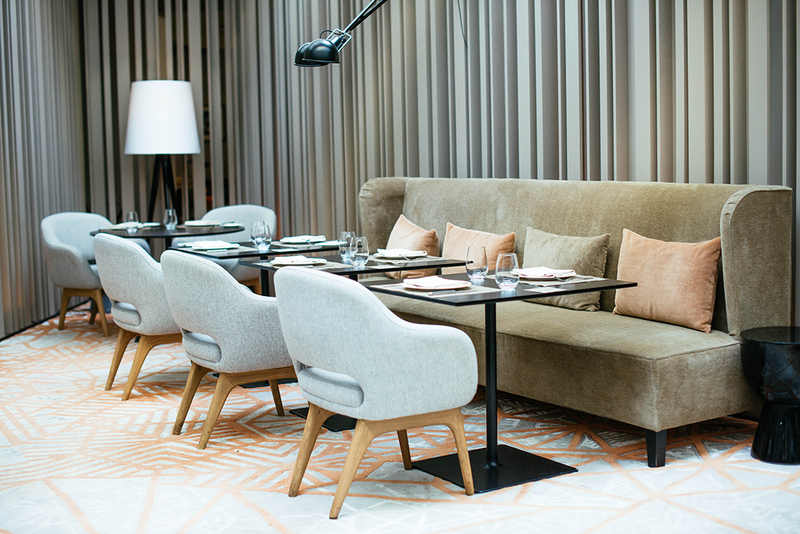 Open Table calls the restaurant Modern European Cuisine, but it definitely has a heavy Japanese influence. Katherine and I both ordered very different things, but we loved all of it! The decor on the inside has more of a lounge feel to it (scroll down to see a pic), while the garden/patio is more relaxed wooden furniture. We sat outside for dinner since the weather was nice and it was awesome! PS – if you love ramen like I do, this spot is where to get it. SO GOOD. While on our way to Charlottenburg Palace, our cab driver (who surprisingly spoke English) gave us some restaurant recommendations and a brief history lesson on Charlottenburg. 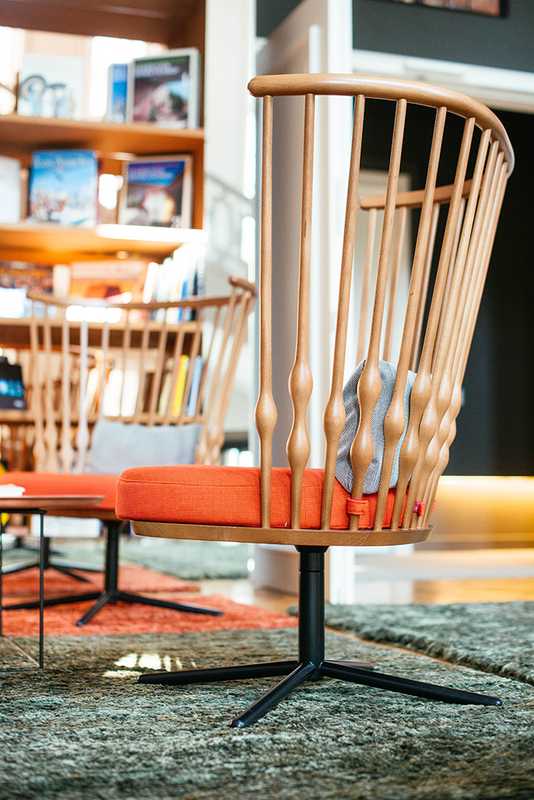 The first place he recommended was Lemke Berlin – this spot is situated right across the street from Charlottenburg, so it was the ideal place for us to grab lunch after exploring the palace and grounds! 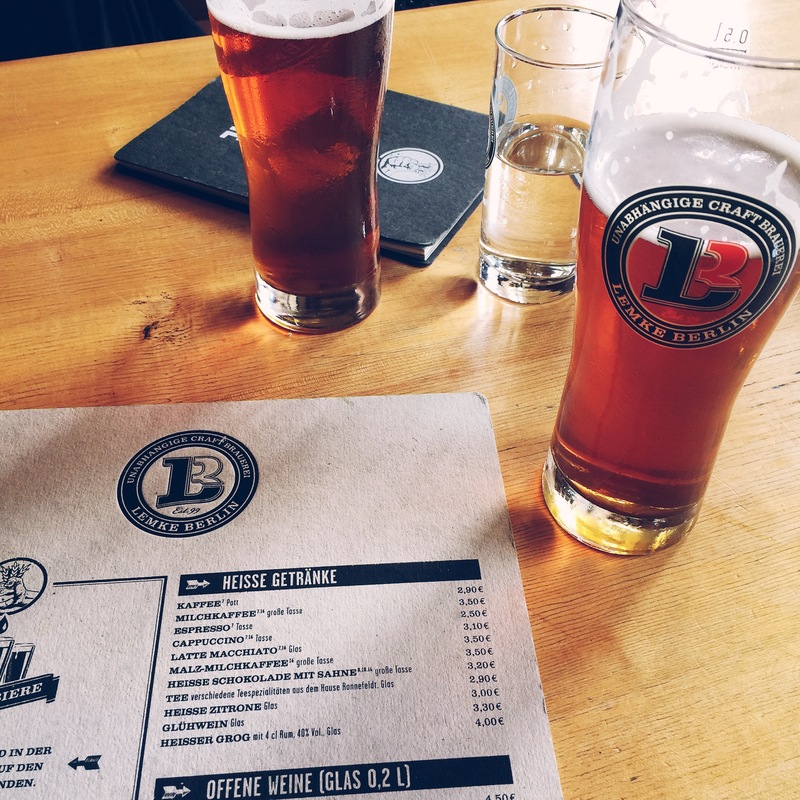 Not only does Lemke feature the best of German cuisine (thinks lots of sausages and schnitzels), but they also brew their own beer! We had a very fun lunch trying some new-to-us dishes and relaxing after our tour. The second place our taxi driver suggested was to grab drinks at Monkey Bar after dinner one night. 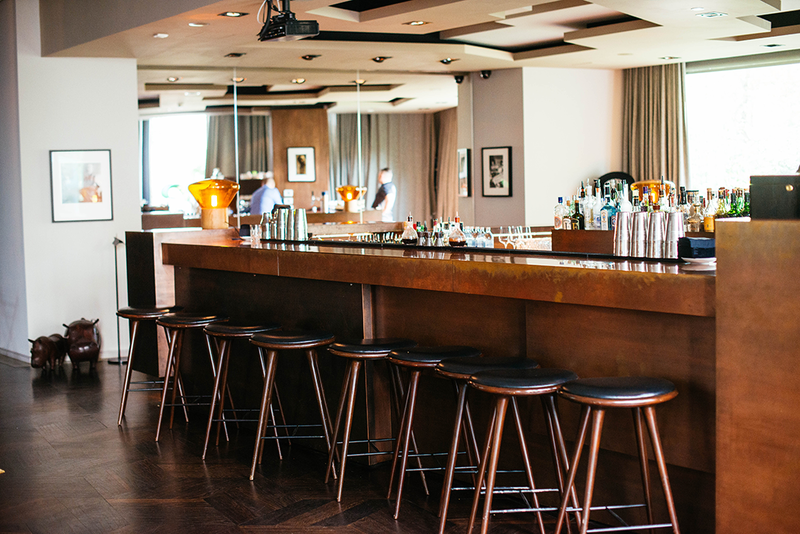 This city hot spot is located on the top floor of a building right down from Das Stue, and features some of the best views of Berlin! It was pretty packed when we arrived around 10pm, but it was so much fun. Definitely recommend for a crowd that’s ready to go out. 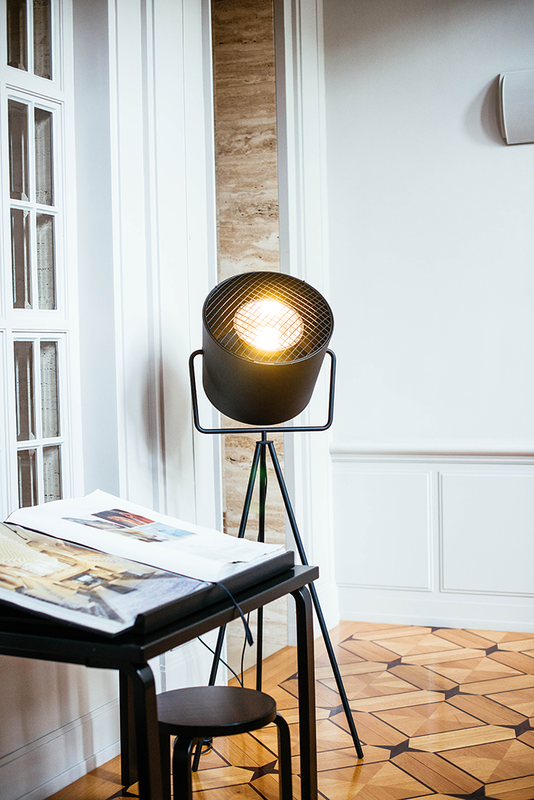 If you’re looking for more of a fine dining experience in Berlin, be sure to make a reservation at Borchardt. It’s one of the only (if not the only) restaurants to have survived the blasts and aftermath of WWII. The restaurant itself is 150 years old! The cuisine is mostly local, and contains an extensive wine list. 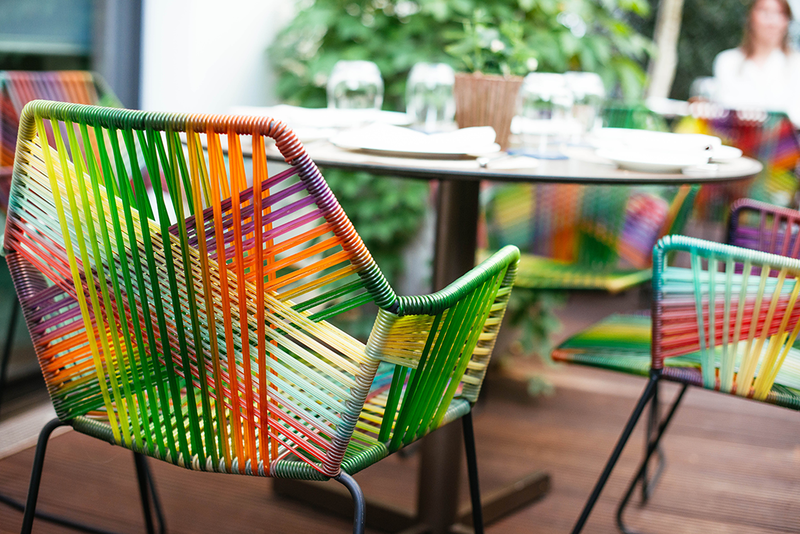 If the weather is nice, ask to be seated in the courtyard – it’s beautiful! 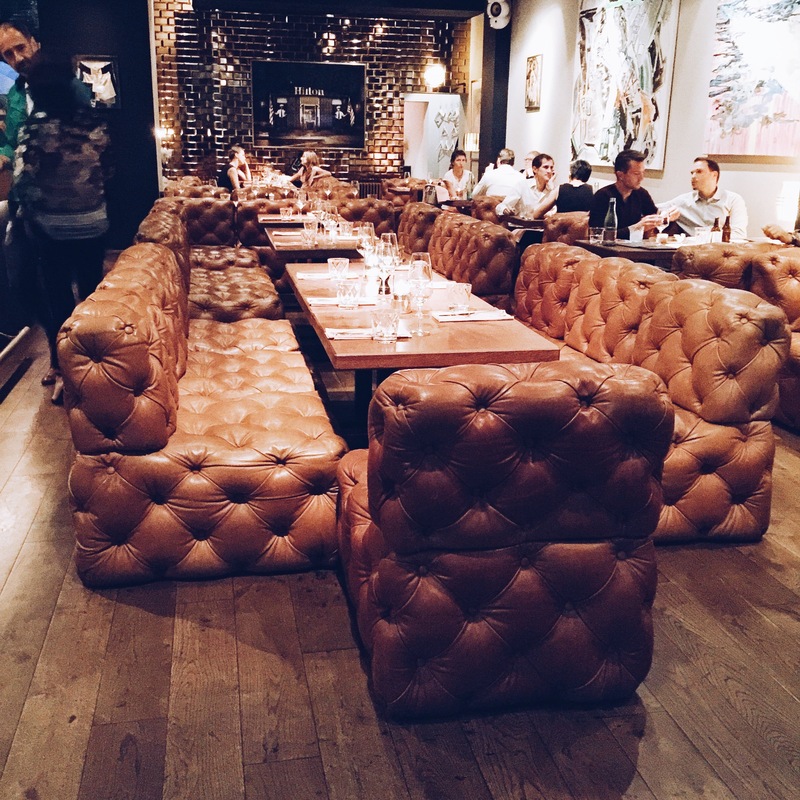 The Casual restaurant at Das Stue. The indoor scene at Pantry. 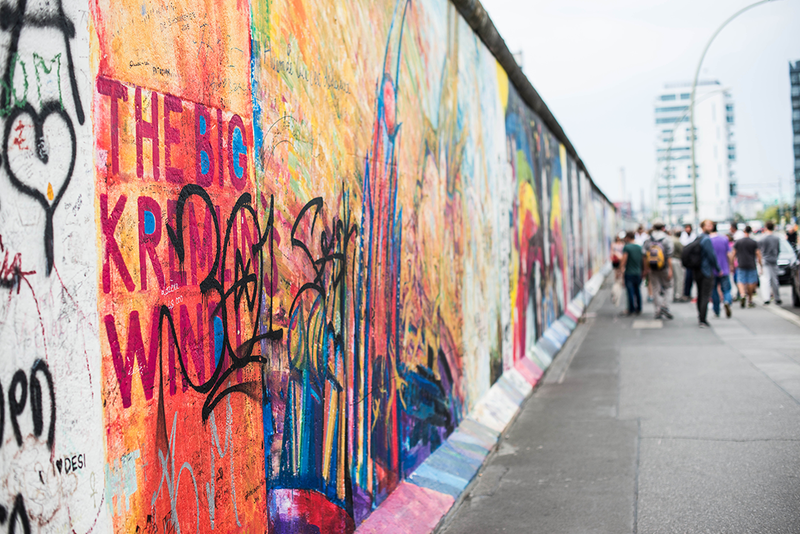 We decided to get the Berlin Wall and East Side Gallery out of the way on our first day in the city. It was actually kind of perfect, because there were a few cafes and little restaurants in a neighborhood only a few blocks away, so we were able to grab a bite before doing the walk. I was actually surprised at how few people were walking the wall. 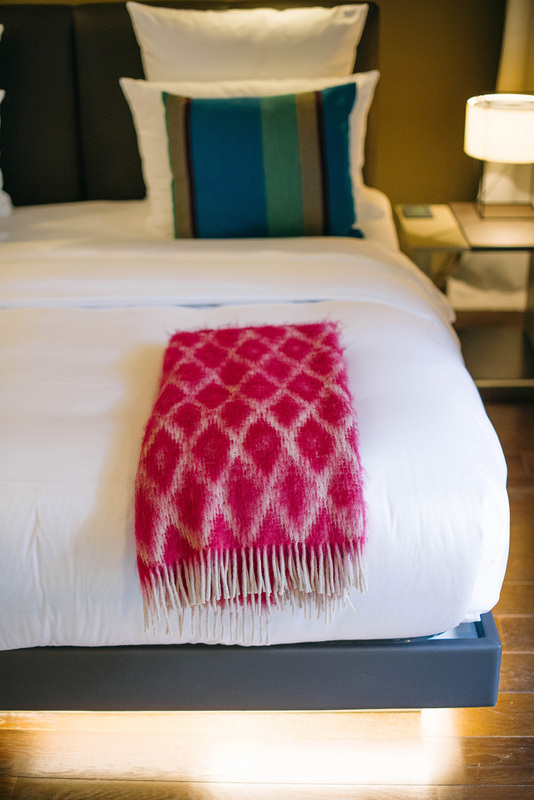 It’s a leisurely activity for you to do when you have some spare time – it really doesn’t take more than an hour to go from start to finish! As I mentioned before, one of our favorite activities in Berlin was biking the Tiergarten. I have to give my friend Katherine kudos for this one, since I had to be convinced. I’m a little skiddish about practically anything that moves fast, and it’s been years since I’ve been on a bike. I struggled the first few minutes getting my balance, but once I got riding I was fine! I was still having trouble with turning at the end, but who cares, I did it! If you stay at Das Stue, you can grab one of their bikes outside and just ride behind the hotel to the park entrance. 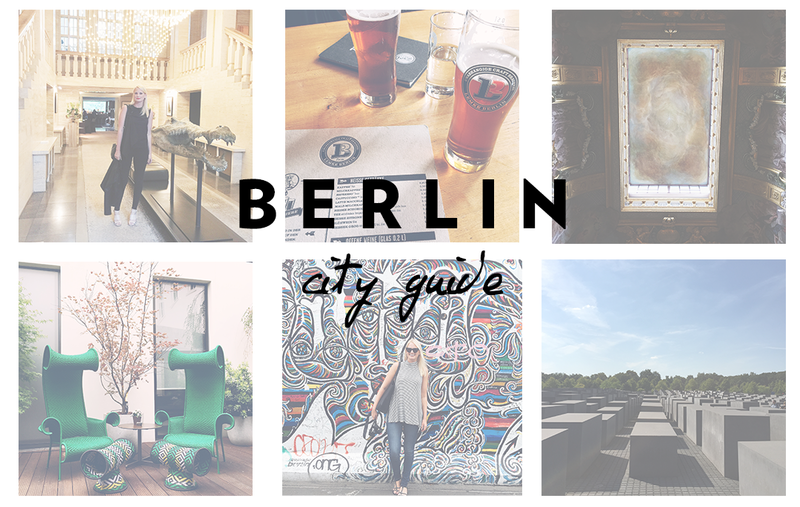 Such a fun activity and good way to explore a new side of Berlin that’s super cheap to do! We felt it wouldn’t be right to leave Berlin without stopping by the Holocaust Memorial – little did we know, but there is actually a museum underneath the monument! In an activity we thought would take 30 minutes, we spent a couple hours going through the museum, reading about 15 very different families from very different places who suffered through the Holocaust. The museum goes into great detail with the timeline of the events, information on the various concentration and extermination camps used, and letters that were sent to and from victims throughout the Holocaust. A somber and heavy afternoon, but totally worth the trip. If you’re a history buff, make this a priority. 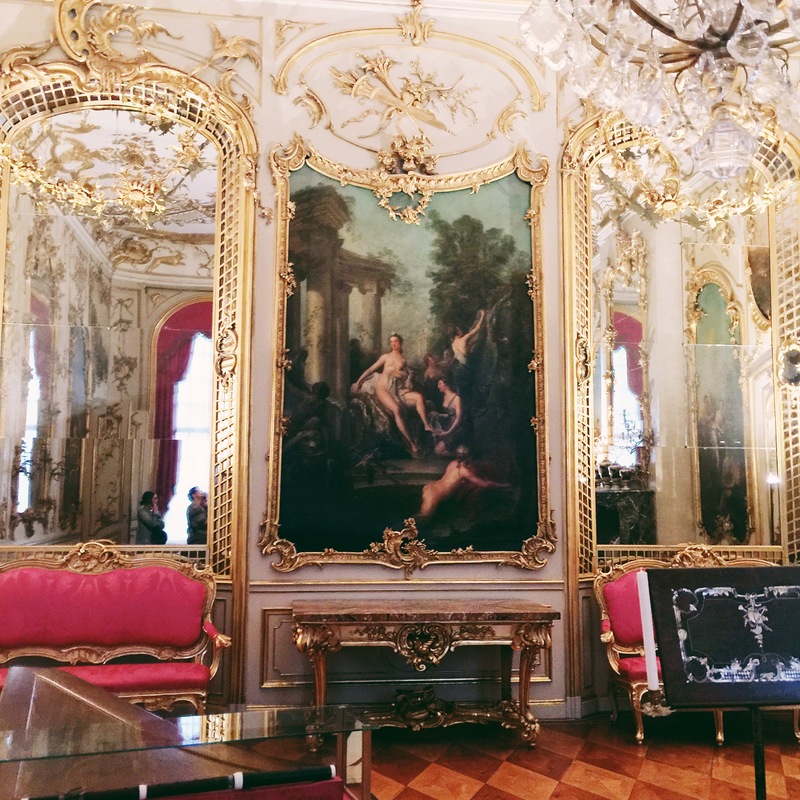 Charlottenburg Palace is a must-do in Berlin! It’s the largest palace in the city and super central making it easy to get to. I shared some pictures from the palace on Monday, but scroll down to see a few more photos that weren’t featured earlier this week! If beautiful gardens and palaces are all you are wanting to see, you should make the quick trip to Potsdam (via train – the station is just 5 minutes away from Das Stue). 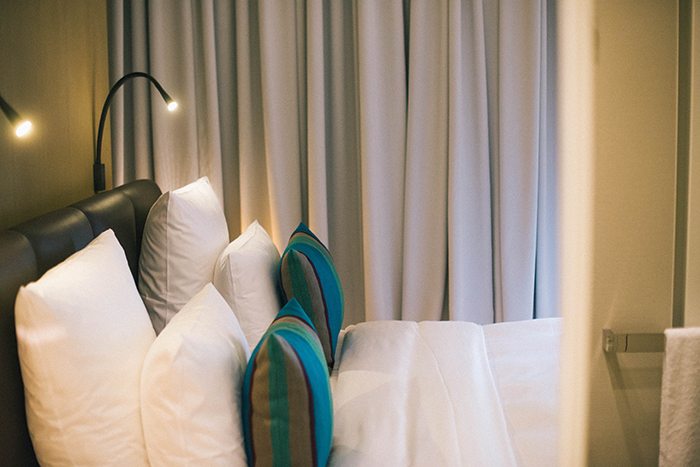 In this quaint little town you’ll find more than just cute shops and cafes. Potsdam is home to over 150 historical buildings and palaces! We visited Sanssouci (stay tuned for tomorrow’s post for more pics!) and Cecilienhof. 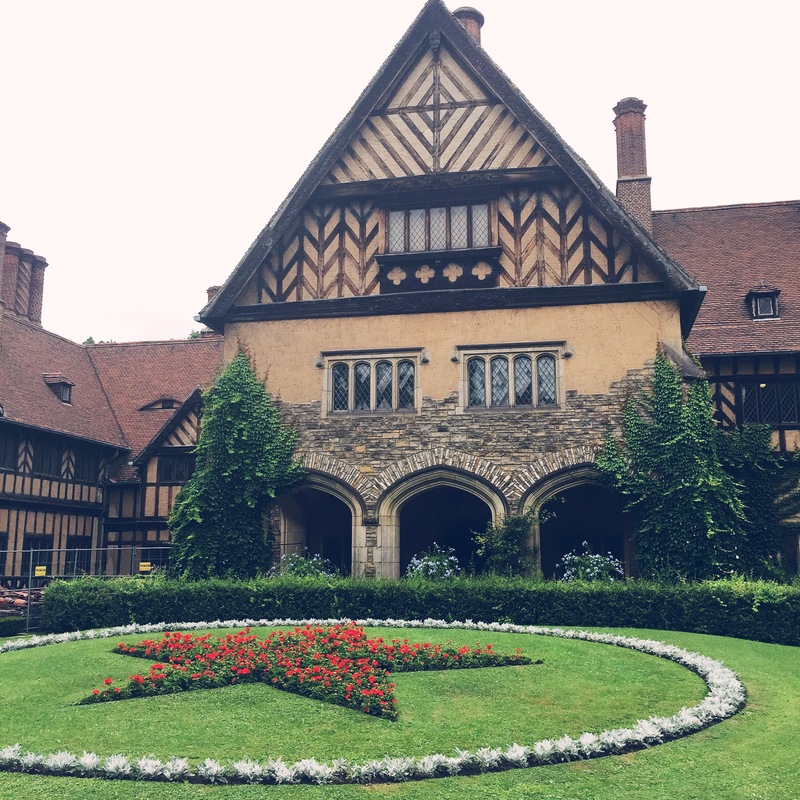 The latter is a must for history buffs – Cecilienhof was where the Potsdam Conference was held in 1945. Very interesting! We didn’t get a chance to see Babelsberg due to the palace being under construction, so if you do plan to visit Potsdam, do your research to make sure all the places you want to visit are open! 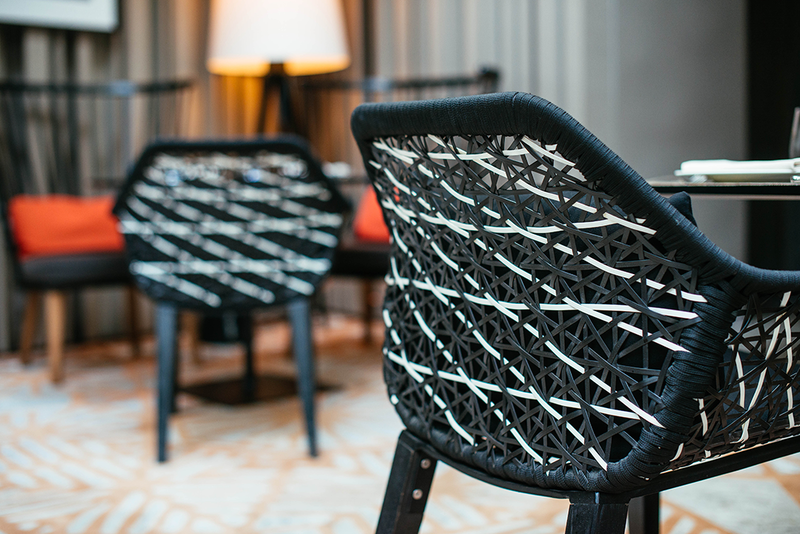 If you fancy a new designer bag or love looking at luxe fashion, head to The Corner to shop. I’ve always loved their online store, but had no idea they had a brick and mortar store as well! 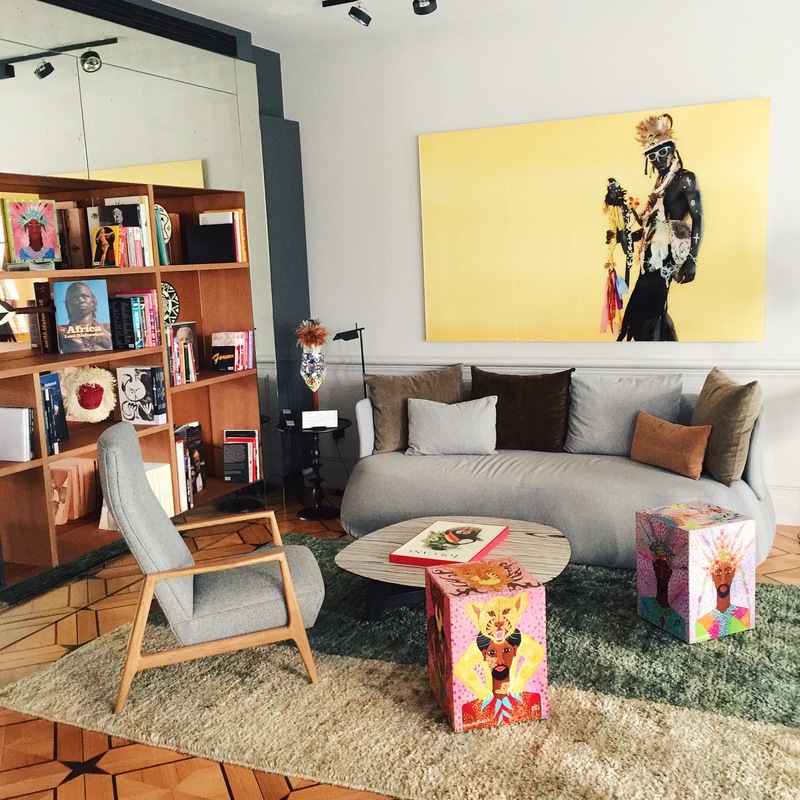 It’s pretty massive for a boutique, but they feature exclusive pieces from Celine, to Valentino, to Chloe. Don’t miss it! 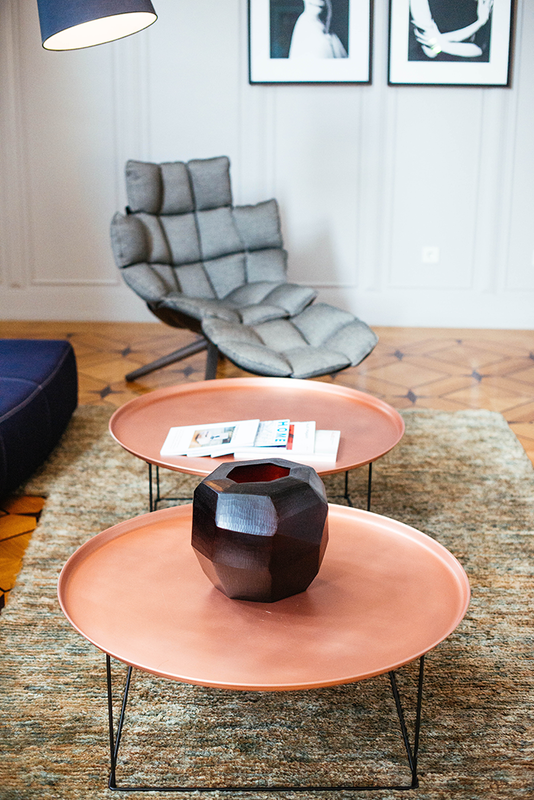 If you’re looking for a wider range of prices, head to Galeries Lafayette right down the street! Walking the Berlin Wall / East Side Gallery. 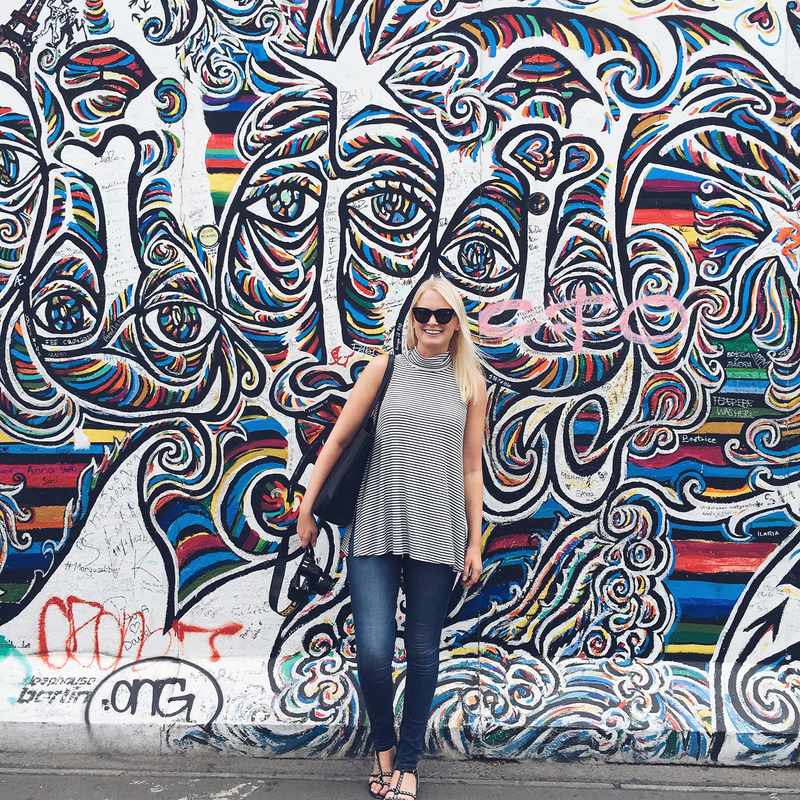 Being a tourist at the Berlin Wall / East Side Gallery. Wearing this top and these jeans. 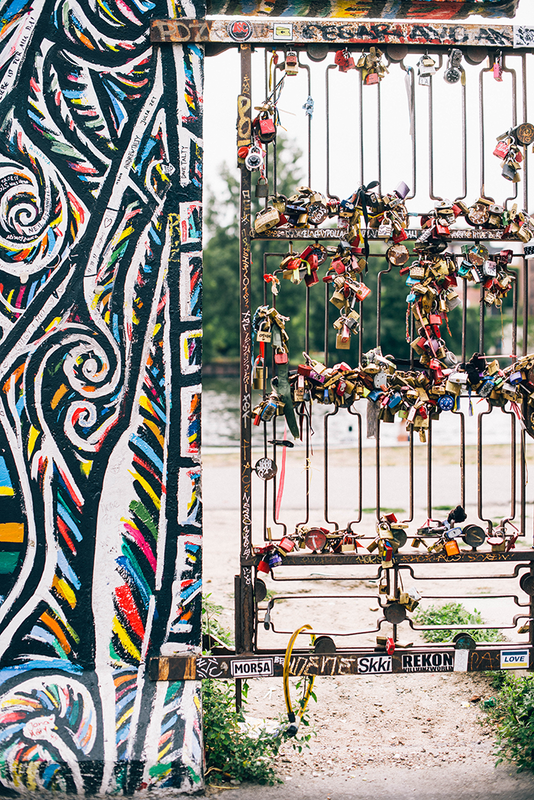 It seems love locks are everywhere, even at the Berlin Wall / East Side Gallery! 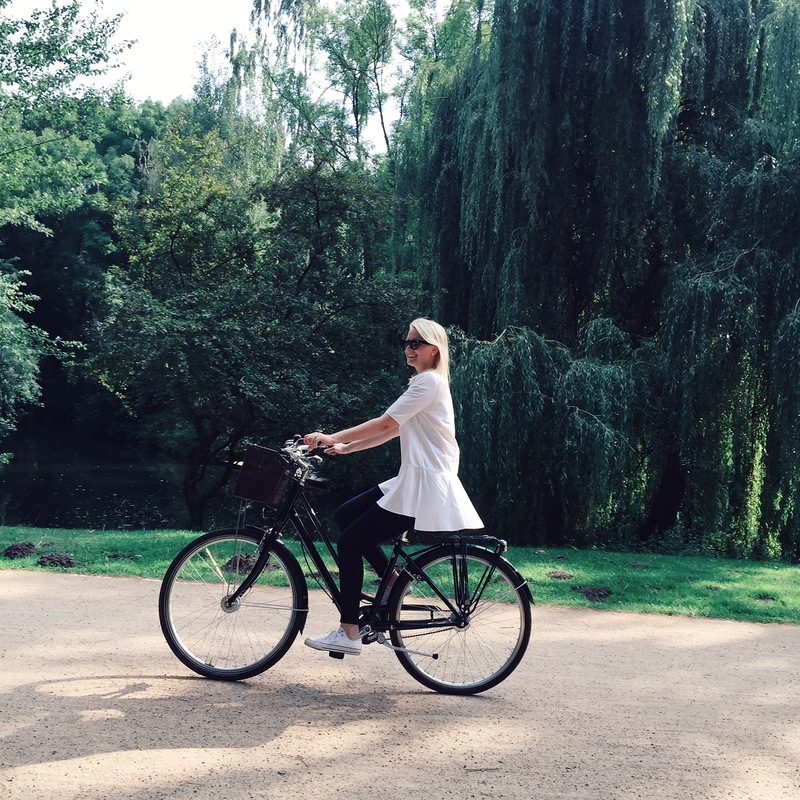 Biking throughout the Tiergarten! Wearing this top, these jeans and these shoes. 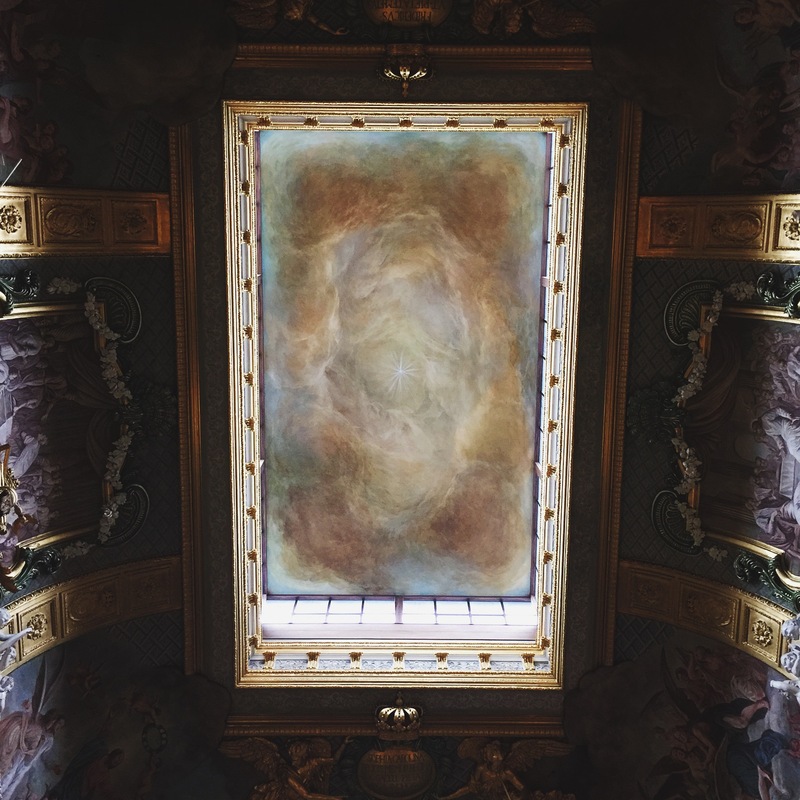 The breathtaking ceiling in the chapel at Charlottenburg Palace. A look at Cecilienhof in Potsdam. One of the many elegant state rooms at Sanssouci Palace in Potsdam. 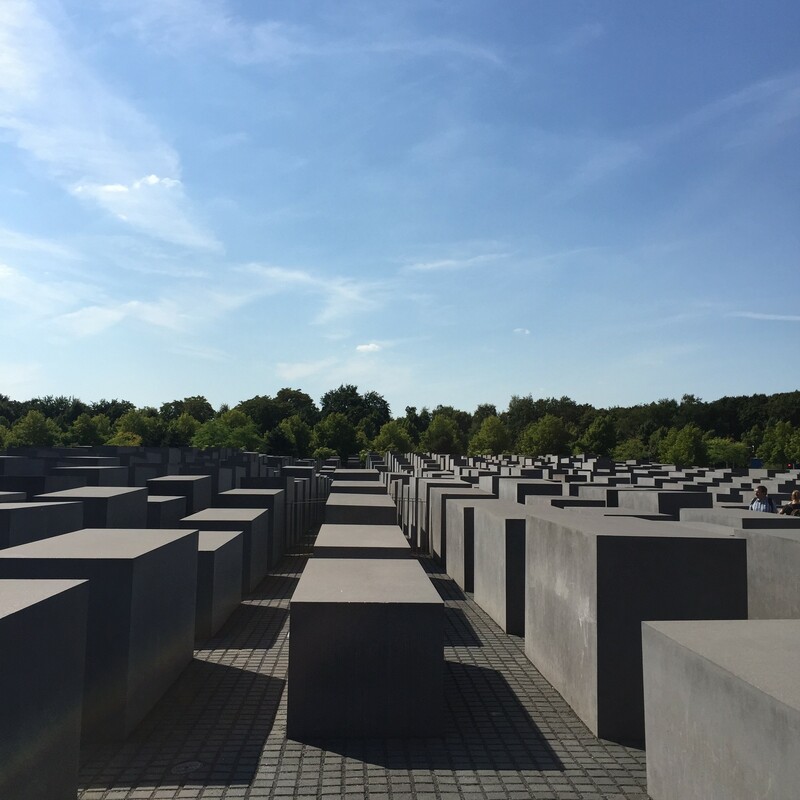 A look at the Holocaust Memorial and Museum in Berlin. Your pictures are absolutely stunning!! Loved reading about all of your recommendations, bookmarking for (hopefully) future use! Really loving your travel guides, friend. 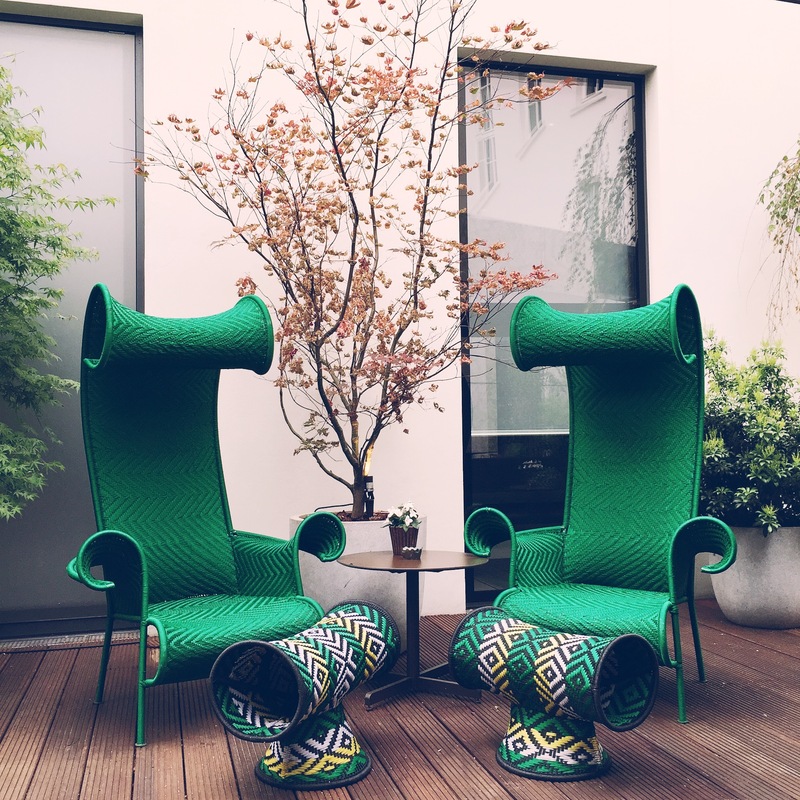 so beautiful.imobsessing over the art and colorful chairs especially the green ones. What a fantastic post! My husband and i were in Italy this summer and decided that Berlin would be somewhere we visit in the next year – this will come in very handy! Beautiful pics and great descriptions. Yay!! You are doing this trip so right!